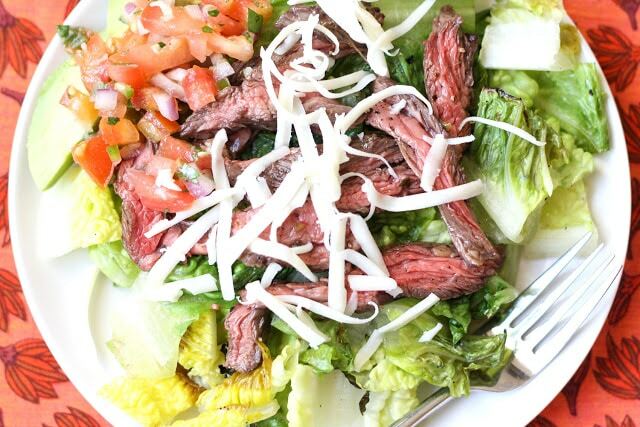 Tender bite size slices of grilled carne asada can be eaten on their own, piled into tacos, or topping a grilled salad. The citrus and jalapeno in the marinade worked perfectly to compliment the rest of the salad. My whole family gave this meal two thumbs up and my oldest son requested that I save the tiny bit of steak that we had leftover for his lunch the following day. 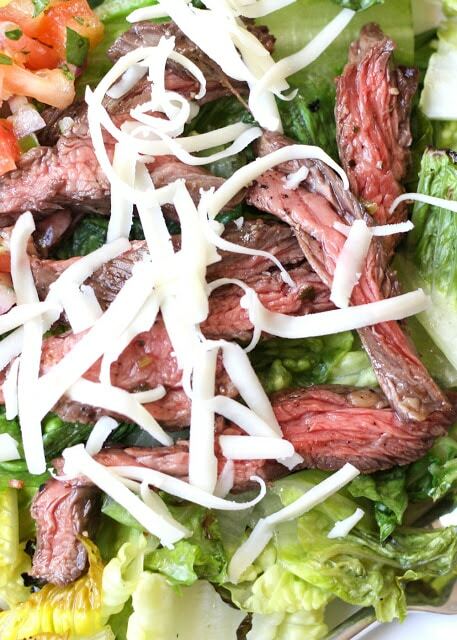 I topped my salad with the steak and the rest of my crew piled their steak into tacos. This steak is so tender, you can cut it with a fork. While we enjoy our steak cooked medium rare, feel free to cook it to the level of done that you like best. Place the steak in a large Ziploc bag or an airtight container of your choice. Cover with the marinade and let rest for 1-6 hours. 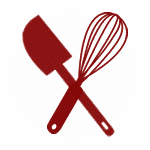 Avoid letting the steak marinate for over 8 hours, it will run the risk of becoming soft or mushy. When you are ready to grill the meat, let it rest on the counter for about an hour to bring it closer to room temperature first. Preheat the grill to medium-high heat. Grill the meat for about 3-7 minutes on each side. Watch closely to avoid over cooking the steak. The cooking time will vary greatly, depending on the thickness of your steak. We grilled ours for just 3-4 minutes on each side and it was perfectly medium rare. Let the meat rest for at least 5-10 minutes prior to cutting it. Slice the steak as thinly as possible across the grain on a diagonal. Cover loosely with foil to keep warm until serving. To assemble the tacos, warm the tortillas (either in a hot skillet or in a microwave) and then top with slices of the beef, lettuce, pico, cheese and avocado. 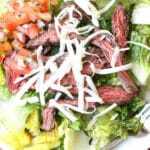 To assemble a salad, layer the plates with lettuce, beef, pico, cheese and avocados as desired. Garnish with limes. Enjoy! * To grill the lettuce: Slice the romaine in half lengthwise. Rinse to clean and then pat dry. Drizzle all sides of the romaine halves with olive oil and then sprinkle with kosher salt and freshly ground black pepper. Place the lettuce halves cut-side down on the hot grill and grill just until slightly browned and then begin to wilt, just a couple minutes at most, then turn over. The halves of romaine were somewhat triangular, so I found it easiest to turn each one three times. When they are done, transfer to cutting board and roughly chop into bite size pieces. While I really liked the warm and enhanced flavor of the grilled lettuce, my husband was not a fan of the flavor at all. I'd been wanting to try grilled romaine for a while and I'm glad I tried it. In the future, I'll toss one-half on the grill for myself and leave the other half raw for my family. I adapted this recipe, tucking the other ingredients inside some rolled, white floor tortillas. I call them burritos!